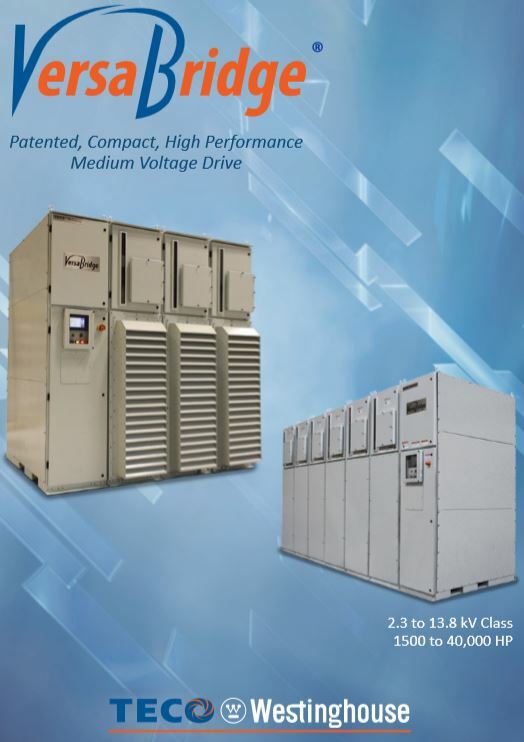 TECO-Westinghouse is pleased to now offer a complete package of Variable Speed Drive (VSD) systems that includes an Input/ Output Switchgear, Medium Voltage Drive (MVD), and motors. VersaBridge® MVDs provide reliable motor control for a variety of industry specific and general purpose applications including Oil & Gas, Utility/ Power Generation, Metals and Mines. These patented MVDs are designed utilizing a multilevel H-Bridge topology that reduces the harmonic levels to extremely low levels. The modular design facilitates ease of installation, commissioning and maintenance. The VersaBridge® is an innovative product that combines reliable, simple, and compact solutions with the latest power electronics and cooling technologies. Modular design with common building blocks (Cube, Slices, Mains) makes the VersaBridge® MVD scalable for different power ratings with fewer spare parts. Power Electronics Modules (Cubes) can be easily removed for maintenance. There are configurable power cable entries/exits on the top, bottom, or both. There are no field cabling requirements to connect the assembled Mains and Slice sections. Modular design requires few spare parts. Additionally, the parts are universal and can be used in any configuration regardless of the voltage or power class. This produces near sinusoidal wave output which reduces motor harmonics and torque pulsation, even at low speeds with virtually no cable length restriction. These harmonics are fully compatible with new or existing motor installations without the need for an external filter and exceed IEEE-519 standard requirements. The VersaBridge® MVD has isolating contactors within each Cube. In the event of a fault, contactors will isolate the faulty Slice and allow the MVD to restart, catching the spinning motor. The VersaBridge® MVD offers the ability to catch a spinning load without any torque, voltage, or current having a negative impact on the equipment. In addition to the Slice bypass option, the drive can be configured to have additional redundancy options for continued operation at full rated output power. The VersaBridge® MVD design provides a five cycle power loss ride-through to keep the process running without the need for auxiliary UPS. The VersaBridge® MVD can start multiple motors and transfer them synchronously to utility lines and back to the drive. Standard protocol allows the VersaBridge® MVDs to easily communicate with various SCADA or DCS systems.